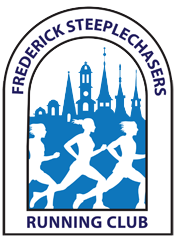 The training leads have done a great job collecting routes in mapmyrun under the Frederick Steeplechasers Running Club “club,” but then mapmyrun went ahead and killed their club feature. Bleh. 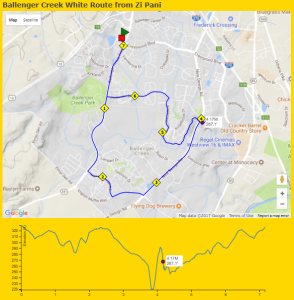 I figured this is a good way to use my technical skills, and set out to develop a searchable place to go to find nearby running routes. 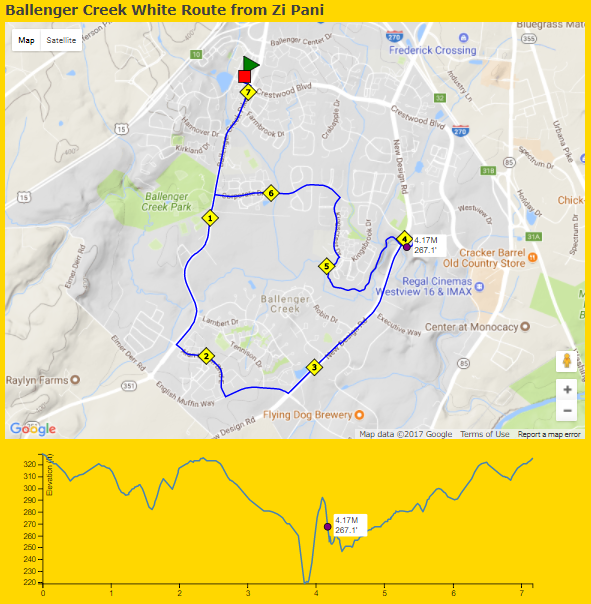 This new running routes database will be located on steeplechasers.org and will be available in the very near future, once I’m done making some final tweaks. Meantime, I’m giving you a sneak peek, so you can see what’s to come. First, let me say, please don’t let the gold background below fool you. I just use that background color to tell me the page I’m looking at is on the test site. 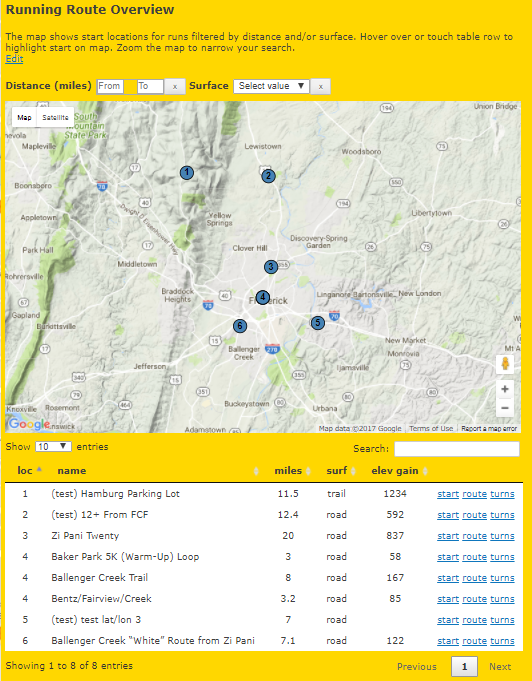 When you bring up the database, you will be presented with an overview page which shows where each of the running routes start. You’ll see a map with a bunch of numbered circles and a table below which will give more information about the routes. You’ll be able to filter by the distance you want to run, and whether you want to run on road or trails. Below the map, you’ll be able to search for a route with a specific name. 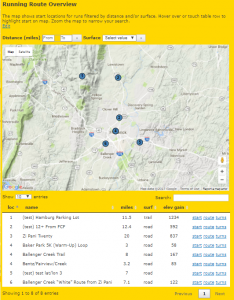 When you zoom the map, the table will become limited to the routes which are visible. This is useful if you want to start near your home, say in Thurmont. From the map, you will be able to touch or click on a location. If the location has a single route, there’ll be a pop-up with more information. If the start location has multiple routes (think Baker Park), it will expand into the routes which start there which can in turn be touched or clicked on to show more information. When you click on the start link from the popup on the map or from the table, google maps will come up with the start location. You can use this to get driving directions. Clicking on route will bring up a map with elevation. And touching or hovering over the elevation chart will show the distance and elevation for that point, on both the chart and the map. Clicking on turns will bring up the turn-by-turn directions, which can be seen in a variety of formats. Bullets and highlighting can be turned on and off, and training leads can use the grid feature to make a page with lots of copies to cut up and hand out. As this is being written (Nov 29), the user interface is pretty much complete. Now I will be building the administrative interface so training leads can easily enter their routes. This database will be available in the next few weeks, so keep an eye out for announcements in your email and on Facebook.